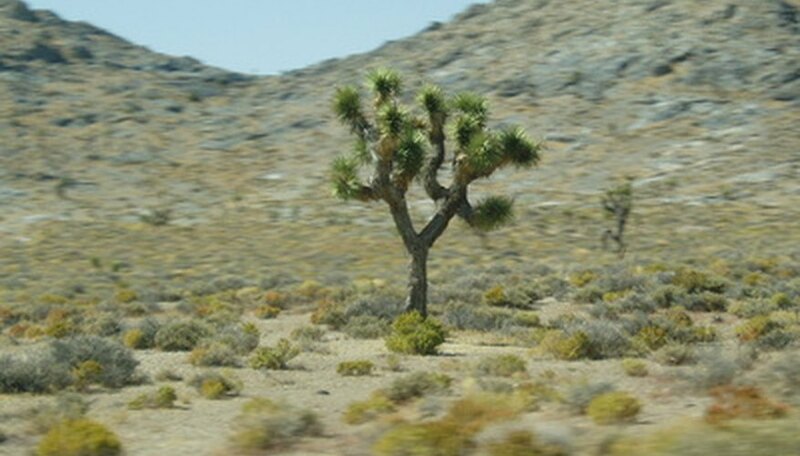 The Joshua tree (Yucca brevifolia) is a Southwestern desert native capable of growing in hardiness zones 7 to 10, which encompasses west Texas's hardiness range. West Texas gardeners should grow this tree outdoors, planting it in the springtime. Like all desert plants, the Joshua tree is low-maintenance and needs little time and attention from gardeners. These trees bear edible fruit and feature greenish white flowers from February to April. Joshua trees are naturally slow growers. Select a full-sun location that offers your Joshua tree ample room to grow. These trees can reach 25 feet high by 15 feet wide. Joshua trees need well-draining soil since they dislike wet feet. Dig a hole twice the size of the plant's root ball, removing rocks, sticks and roots from the hole. Jab your shovel at the bottom of the hole, loosening the soil, so the tree can easily adapt to its new environment. Remove your Joshua tree from its container and massage the root ball between your hands to break it apart. Unwind tangled roots before planting. Then place the Joshua tree in the hole so it sits at the same depth as it did in the container and its trunk is vertically straight. Backfill the hole with soil to plant your Joshua tree. Gently firm the soil around the plant's roots and trunk. Water the tree until the ground becomes saturated. Then allow the soil to dry out thoroughly. As desert plants, Joshua trees do not need lots of water. Provide the plant with deep watering whenever the soil becomes dry and crumbly to the touch. Then allow the soil to dry out again until it is thoroughly dry and dusty. Fertilize the Joshua tree in the spring when it's in active growth. Use a slow-release fertilizer for desert plants and follow the manufacturer's dosage recommendations, based upon the tree trunk's diameter. Scatter the appropriate dose of dry fertilizer on the ground around your Joshua tree, then water the ground to disperse the nutrients.